I heartily endorse this book, with it’s heartwarming and very real collection of personal experiences with embryo adoption. I am a physician researcher, and lecturer. I have spent much of the last seven years advocating, explaining, researching and publishing on the subject of embryo adoption. Yet, I can tell you that no scientific information nor facts nor figures can substitute for real human experiences – that those who have had them are willing to share publicly. Maria Lancaster is both a colleague and personal friend. I have advocated for Embryo Adoption Services of Cedar Park in many different settings, explaining that Cedar Park is the nation’s only church-based embryo adoption endeavor. Open this book, and read about real-life experiences. You will have a new perspective on the beginning of human life. Follow an inquisitive little boy who learns of his parents’ quest to have children, and the success they ultimately achieve in creating a family. Told in a language a child can understand, read the tale of how mom and dad met, fell in love, and ultimately built a family. This story on the gift of embryo donation is part of a book collection that brings to light the many reproductive options of family building. Come and celebrate the unique gift couples can receive on their way to becoming a family. A story book written in age-appropriate, loving language and tells the story of how a child came to be via embryo donation or embryo adoption. The book is written for 3-5 year olds. Using bears as characters, the illustrations depict the typical day in the life of a child interacting with their parent. The story describes a child conceived by in vitro fertilization using the egg and sperm of another man and woman. The embryo is placed inside the mother’s uterus, who then carried and delivers the child. The story does not contain the words “sperm” or “egg”. The term “embryo donation” is used. This book is written for heterosexual couples and uses the words “Mommy and Daddy”. Can one couple’s dilemma be the answer to another couple’s hopes and dreams? Yes! 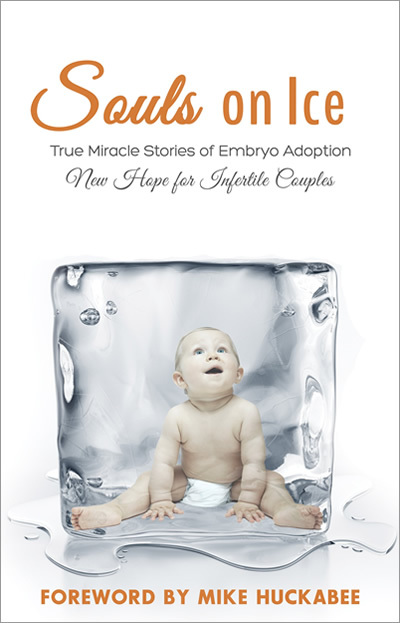 If you are a couple with precious, frozen embryos, this book provides Christian-based guidance on the loving, life-affirming option of embryo donation. If you are a couple who is longing to have a baby, this book will help you consider the adventure of a lifetime—becoming parents through embryo adoption. Sensitively written in an easy-to-read style, this book is a must-read for those interested in learning more about new opportunities in embryo donation and embryo adoption. The issue of embryo adoption, having leftover embryos frozen in liquid nitrogen thawed and implanted in an adoptive mother’s womb, is a thorny subject in Catholic moral theology and ethics circles. www.tapestrybooks.com Large distributor of books about adoption, check it out. www.nacac.org North American Council on Adoptable Children (NACAC). Hundreds of families from across the country who have built their family through various adoption methods unite annually to fellowship and attend workshops and trainings that best address their specific areas of interest. www.focusonthefamily.com Focus on the Family has a mountain of helpful resources on parenting, including adoption of all kinds. www.redcross.org The Red Cross also offers first aid and safety classes, including infant CPR. You can see where these are in your area. www.parentsasteachers.org These trained professionals meet with prospective adoptive parents (even prior to pregnancy or adoption) as well as parents of children ages 0-3 years old. They offer child development resources, assessments and activities (for free). This is a great resources. www.amazon.com Search “embryo adoption” “adoption” “parenting an adopted child” there are a lot of resources for families available. “Setting the captives free” – is there precedent for embryo adoption in scripture and medieval Christian tradition? The issue of embryo adoption, having leftover embryos frozen in liquid nitrogen thawed and implanted in an adoptive mother’s womb, is a thorny subject in Catholic moral theology and ethics circles. Our Moral Obligation to the Abandoned Embryo Rev. Peter F. Ryan, S.J.